The Black-headed duck is a member of the Stiff-tailed ducks and has been considered as the link between the Stiff-tailed ducks and surface-feeding ducks. Unlike other stiff tails it rarely dives for food, preferring to feed in the dabbling manner of most surface feeders. In the wild it can be found in central Chile and Argentina but also occurs in smaller numbers in Uruguay, Brazil, Bolivia and Paraguay. The Black-headed duck that is also sometimes referred to as the Cuckoo duck is the only member of the waterfowl tribe that is an obligate nest parasite. This dependence on other species to perform the incubation of its eggs has required the evolution of a very quiet unassuming little duck that does not have the territorial aggression of many other species, these qualities appear to have been overlooked by many waterfowl enthusiasts because the Black-headed duck has sadly never been well represented in waterfowl collections and it is so easy to accommodate. Black-headed are not the most highly coloured of waterfowl, the male as the name indicates has a black head and neck with the remainder of the body being very dark with some Rufus markings, the bill is a dark blue grey and when in breeding condition there is a bright red patch at the base of the bill. The female does not have the black head and is generally a dull buff to Rufus brown bird with a distinctive dark eye stripe. The ducklings are delightful, they have very thick down that is mottled buff, yellow and black with a distinctive eye stripe as in the adult female. Black-headed are a small duck, similar in size to a Cinnamon Teal and unlike all the other stiff tails it is more of a conventional ‘duck’ shape, lacking the very round appearance of the tribe. When on land, like other stiff tails it is apparent that the legs are set well back on the body giving them a very ungainly appearance but do not be deceived, if they decide to run they can do so at quite some speed but stopping is a rather haphazard procedure. During the long breeding season, they can lay from late February though until the end of September the male is almost always displaying, it is not a dynamic display but it is certainly interesting, he inflates his cheeks and neck and goes through various head pumping manoeuvres while rapidly raising and lowering his wings and tail and during this display he makes various strange croaks and piping calls. 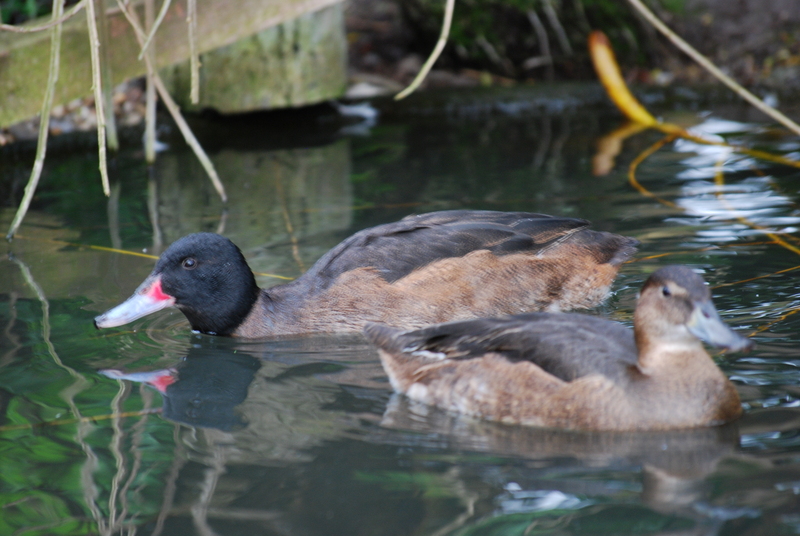 Black-headed are easy to maintain in captivity and can be kept on artificial or natural ponds but they really appreciate being able to forage in vegetation close to the waters edge. During the breeding season they spend significant amounts of time searching for appropriate nests to deposit their eggs in and they will happily wander quite significant distances from the water and the male almost always accompanies the female on these prospecting wanderings. As with most other stiff tails their eggs are large for the size of the bird and they will deposit their eggs in virtually any nest they can find, be it a moorhen, coot or any other species of waterfowl. The incubation period is short and possibly variable between 22 and 25 days, variables that assist with a successful hatch when the host species can have a relatively short incubation period. Artificial incubation is not difficult but it may be an advantage to try and ensure that they are incubated with other eggs that will hatch once the Black-headed have been incubated for about 23 days. Once the duckling starts to move in the egg it becomes very vocal and surprisingly loud. Once hatched, in the wild the duckling would leave its host parent and set off in life with no parental guidance and in consequence this makes them relatively easy to rear in captivity. Black-headed are certainly not stunners but they are interesting and unusual and really deserve greater popularity in captive collections than they currently have. Reference : Ducks, Geese and Swans, Volume 1. Janet Kear. Oxford University Press. When the male is not in breeding condition he would not have the red patch at the base of his bill, this picture also helps show how far back the legs are positioned making the Black Headed very ungainly on land.